John Prestwich lives just minutes from death. Paralysed, unable even to breathe, a mechanical ventilator keeps him alive. If it fails, John will be unconscious within three minutes and dead within five. He holds the Guinness World Record for being completely dependant on a ventilator for over 40 years. His ventilator gives him one thousand breaths an hour, eight and a half million a year and over 350 million since he contracted polio on his seventeenth birthday on the 24th November 1955. 1996 was Polio Awareness Year, marking forty years of the polio vaccine which, for John, came too late. Last December he and his wife Maggie celebrated their silver wedding anniversary. John was the first person with such severe disability to get married. Despite his disability he leads a busy life. He has been to the top of the Eiffel Tower, frequently attends his favourite sport, polo and regularly communicates with people all over the world by phone, fax and on the Internet, yet forty years ago he couldn't even call a nurse. In 1991 he was recognised as a 'Man of the Year'. 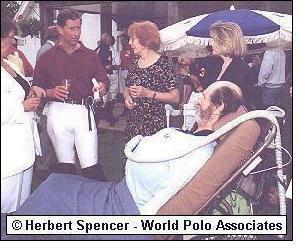 In 1994 he was awarded the MBE in the Queen's Birthday Honours list. Early in the morning of 24th November 1955, 'Herdsman', a ship of the Merchant Navy, docked in Corpus Christi, Texas. 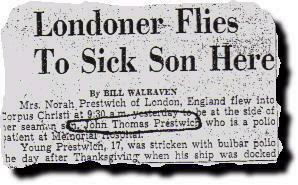 Serving aboard was a young English seaman, John Prestwich. It was their last port of call and John, looking forward to being back in England for Christmas, was helping prepare the ship for unloading. He felt unwell and reported sick to the first officer, and went back to his bunk. "I needed a pee," he said, "and I can still remember everything going round, I was very wobbly." That was the last thing John ever did on his feet. He made it back to his bunk and fell asleep. When he woke up, he couldn't lift his face off the pillow and was suffocating. Somehow, he managed to move his head slightly: the movement saved his life, but was the last he ever made. It was here that someone eventually found him, paralysed and petrified. "I remember waking up." he tells, "My cabin was full of people. There was a doctor, and the Captain was there." His final memory of that day is being taken off 'Herdsman'; "I remember being lifted onto a stretcher and along the deck. All I could see were faces looking down, the black sky behind, and the blazing arc docking lights on the derricks." Sometime later, he woke up in an iron lung at the Memorial Hospital in Corpus Christi. Polio had been confirmed. The virus had attacked the nerves in his spine, effectively blocking the brain impulses from reaching the muscles in his body. He was paralysed from the neck down and his muscle fibres were beginning to shrivel and die. Pain impulses however, from his body, back to his brain, were not affected. John could feel everything that was done to him, feel the pain and discomfort, but he could do nothing about it. Back in England, his mother and father received a telegram informing them of his illness. John's mother, Norah, desperately sought help to be by her sons side in Texas. "Nobody wanted to know, " she remembers. 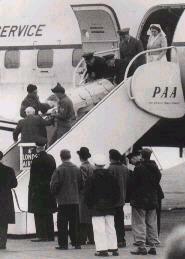 Finally, with the help of a Roman Catholic Priest, who put his American bank account at her disposal, and with help from the Daily Mirror in London, a relay of flights was arranged. Nothing could prepare Norah for the reunion. "They gave me twenty-four hours to get over the shock." she remembers, "It was a terrible time. I didn't know whether I was dreaming, having a nightmare, or whether this was reality." She was expected to take a share of the nursing duties and slept in a bed alongside John's iron lung. Three weeks later, on Christmas Eve, she decided to host a party for John and the nursing staff. She asked John's doctor for directions to the nearest liquor store. "Mrs Prestwich, " he said, frowning, "in Texas, ladies don't drink." Norah shouted back; "Look darling, I ain't no lady and I'm not from Texas. If I don't get a drink soon I don't know what I'll do." 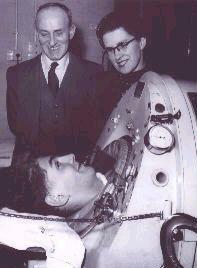 After three months, the U.S. Air Force made arrangements to fly John home to England in his iron lung. "The iron lung itself was pale blue, and the nurses bought me some matching pale blue pyjamas. I told them I would come back to give them a dance. Of course, I never did." 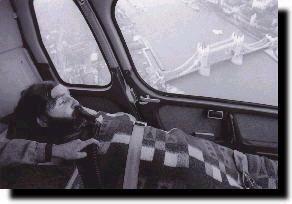 On March 5th he was airlifted home to London. 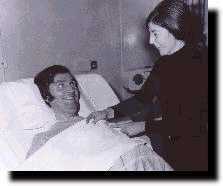 Right: John is re-united for the first time with both his mother and father at the Royal Free Hospital, Hampstead, London. Described by many as, "a coffin on legs," the iron lung was developed in the 1930's to ventilate people whose lungs had stopped functioning. John's inert body lay inside the chamber of the machine, only his head outside. A rubber seal collar around his neck ensured an airtight cavity and a pump alternately raised and lowered the air pressure inside. To make John inhale, the pump would create a partial vacuum, which forced John's chest to expand, drawing air into his lungs through his nose and mouth. When the pump released the vacuum, John's chest would gently recoil and he would breathe out. This cycle repeated about 16 times each minute. His only view of the world was backwards, through a mirror mounted on the lung, in front of his face. John's first two years back in England were critical. "When I came back from America I wasn't really expected to live. I was ill for a long time." He recalls once lying in his 'lung' when everything began to go quiet, dark and comfortable. The incredible pain he had suffered began to fade away. " I think I was on the way out. I remember laying there in this room with an open fire at one end. I didn't want to give in, I was interested in what was going on tomorrow. I'm sure that sometimes your illness or condition is like an enemy, that wants to kill you. I didn't want to be killed." John believes in the force of willpower. He'd seen people arrive at the ward, "put their face to the wall and die." But he didn't want to give in, "I don't know why. Some of us are more bloody minded I suppose." Looking at the progress and prognosis of other polio patients around him, John reasoned that as he wasn't dead yet, he would probably recover, as many others had. He only realised the true extent of his disability when talking to a physiotherapist one day: "When I start moving, " he asked, "which part of me will start moving first ?." The physiotherapists silence told him all he needed to know. He was never going to move again. "I felt so stupid," he says, " embarrassed that I had been so naive not to realise this earlier." As he began to take an interest in life once more, his physical and emotional condition began gradually to improve. He still couldn't breathe, and knew that it would never be possible. He began to use a respirator - which forces air into the lungs through a mouthpiece - for short periods, enabling him to lie on a bed, and even sit in a wheelchair. But as the polio virus destroys the major motor nerves but leaves the sensory nerves intact, the pain of movement was intense. Having laid flat on his back for so long, his body bitterly protested when nurses moved his useless limbs into new positions. John recalls his first venture out of the hospital, "I first started going out in the hospital grounds. There was a porter, George, who'd taken me under his wing and he used to shove me all over the place. We once went to the front gate and I saw all these strangers. I was ready for going back to my little shell, but George insisted on taking me round the block." For the first time John was free from the insulated environment of the hospital and found he was the subject of gazes, gossip and wondering whispers. "You get all kinds of reactions, " he recalls, "I could see from their faces they were probably thinking that I ought not to be let out on the street." At that time, he says, disabled people had less freedom than now, "Most of us were put into warehouses in the hope that we kept quiet and didn't frighten the horses." He describes these early ventures into the outside world as "putting my toe in the water." But then he started to do other things such as going to the cinema, the theatre, and trips round the West End. "One day we went to Brighton. I was really testing myself." One ambition led to another. He wanted to go to the top of the Eiffel Tower. The trip had to be done in one day, because he slept in the iron lung. "It turned out to be terribly difficult," he explains, "As soon as the airlines heard about me they put up their hands in horror." A private plane was provided for the trip and he was flown to Paris, where he met members of the press who were covering the story. He had drinks with them at the top of the Eiffel Tower. Among the many newspapers who reported the trip the following day was the London Daily Herald; 'They reached Paris at 11.30 a.m. and were met by a car from the British Embassy. Then followed a sightseeing tour - Notre Dame, the Arc de Triomphe, the Champs Elysees, and the Eiffel Tower.' John says, "I had to prove to myself that I could do it. I've never been abroad since, I've no desire to. I don't need to do it again, but at the time I did." By now John desperately wanted his own form of transport. Unsuitable in any other vehicle, John had to hire a Daimler belonging to the London clinic every time he wanted to go out, and it was made available to him only four times a year. It wasn't enough. "What I needed was a vehicle of my own. A vehicle with glass round the sides and enough room in the back to lay down in." John realised that the vehicle he was describing was a hearse, and placed an advertisement in The Times; 'Hearse wanted by frustrated iron lung victim.' Two were offered, one from students, and one from a funeral director wanting seven pounds. The latter was brought to the hospital for John to examine. "The chap who drove it was all in black with a black hat. "It was magnificent." said John, "It had big brass headlights on the front with a huge spare wheel on the bonnet. The windows were engraved with wreaths and I thought it was lovely. But all hell broke loose." John's consultant turned up. He had been aware of John's plans, but had not taken them seriously. Faced with the prospect of a hearse being parked in the hospital grounds he insisted that it should be kept elsewhere. "I had nowhere else to put it," says John, "so I had to turn it down." Maggie Biffen had been working as an Occupational Therapist in the USA and Canada before she arrived at the Royal Free Hospital, where she was charged with the responsibility of providing John with 'Diversional Therapy' which meant keeping him occupied. Someone had suggested tapestry. "It was ludicrous," remembers Maggie, "I had to poke the needle through the cloth and put it in John's mouth, then take it out of his mouth and push it back through the cloth again." She taught him to paint a little with a brush in his mouth. It was hard work. Having no head movement he had to use his tongue, jaw and face muscles to control the brush. He eventually learned sufficient control to sign his name. Maggie read to John, wrote his letters and occasionally helped with his dressing and outings. John's cold clinical room began to take on a more homely feel. He wasn't allowed to have a cocktail cabinet, but the hospital provided a bookcase and gradually all the books were replaced by bottles and glasses. He had a record player, television, and electric frying pan. Maggie and John began to spend their evenings listening to music, reading and enjoying snack meals together. Over the next few years their relationship evolved from being purely professional to something much deeper. They began to fall in love. John was frightened. He saw himself, paralysed and penniless, as having no prospects. There was a crisis in 1962 when John had to be moved to another hospital, St. Ann's in Tottenham, due to redevelopment at the Royal Free. He was devastated. "At the Royal Free I had created a comfortable and secure environment for myself." The four bedded ward, where he was usually alone, had become his home. At St. Ann's, he shared an open ward with other polio patients. But the move proved unexpectedly beneficial. He met patients in similar circumstances, but who had managed to shed the sheath of the iron lung. Many were using more portable devices called cuirass respirators. An airtight dome shaped fibreglass shell strapped in place over the chest and abdomen. Connected by a hose to a pump, it worked on the same alternating pressure principle as the iron lung, but was lighter and more portable. For the first time in seven years he could sleep on a bed, and view the world the right way round, rather than through the mirror of the iron lung. After work at the Royal Free, Maggie spent three evenings a week with John, sometimes staying so late that she would miss her bus home. They still had no prospects of any future 'normal' life together, but their relationship survived and thrived, day-to-day for the next nine years. Thoughts of marriage never entered their minds until 1971, when John's uncle made a deed of gift to him. It amounted to sufficient capital and income for John to leave hospital. But no one with such severe disability had ever entered into marriage, no one who required such critical constant care had entrusted their life to one woman, yet on 11th of December 1971 they were married at St. Paul's Church in Chipperfield, Hertfordshire. 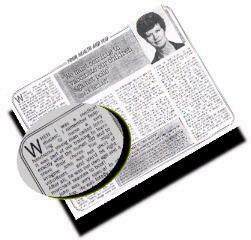 In November 1980, the 25th anniversary of his contracting polio, he received a personal letter from the Prince of Wales, who had become friends with him two years earlier. And waiting for him on the local village green was a helicopter which took him on an airborne tour of London. It was Dr Last who nominated John for the RADAR (The Royal Association for Disability and Rehabilitation) and Leeds Building Society 'Man of the Year' award. At a presentation at London's Hilton Hotel, awards were given, amongst others to such distinguished names as Brian Clough OBE, General Sir Peter de la Billiere, John Simpson CBE and Graham Gooch OBE. John characteristically felt humbled by the company and told reporters; "It is a great honour to be included with such a distinguished group of people." For the last twenty-five years, John and Maggie have been completely independent in their home. 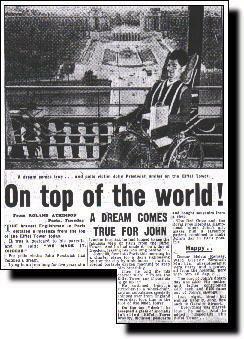 John has a specially modified bed which also serves as a wheelchair. Beneath it is mounted a respirator and batteries so that he can travel. They have a converted 'minibus', and take regular outings to friends, shopping and to watch their favourite sport, polo. John controls much of his environment by whistling. A series of whistled codes detected by a microphone is converted by a computer into actions. He can thus control the television, video and hi-fi, open and close curtains and turn lights on and off. He makes and receives telephone calls. A video camera lets him see who's at the front door, and an electronic lock lets visitors in. He uses a voice-activated computer for word-processing and games. "Forty years ago, I couldn't call a nurse when I needed one, " he remarks, and adds, " now I can communicate with people all over the world by fax, phone and the internet." When John entered the Guinness Book of Records as the longest survivor on a mechanical respirator, his next door neighbour's young daughter was asked why she thought he was so special. She replied, "He's the only man in the whole world who can answer the front door by whistling." Polio doesn't affect the sensory nerves, just the nerves that control voluntary muscles, so John and Maggie have a healthy, but modified physical relationship. They have no children through choice. John felt he should be able to look after them properly, which he couldn't. "So we decided not to have children." John's life is always under threat. Even a common cold could kill him. "One thing I hate," he says, "is when people come up close to tell me they won't get near me because they've got a cold." Because of John's paralysis, he cannot cough. For us, coughing may be an unpleasant inconvenience, but when the reflex fails, as in John, it can be catastrophic. If he contracts an infection, however small, the usual consequence is a lengthy stay in a hospital iron lung, coupled with frequent and painful physiotherapy and drugs to overcome the infection. Crucial to John's well-being, and indeed his life, is the mechanics of his ventilators. Each undergoes regular maintenance in order to minimise the risk of breakdown. He has the 24 hour support of the medical and technical staff at St. Thomas' Hospital in London. A specialist unit provides all the necessary clinical and technological back-up that people like John need to stay alive and healthy. "With no back up, I could survive about 3 minutes if the respirator failed." he explains, but goes on, "I've been taught a technique called 'frog' breathing, where I use my tongue and upper neck muscles to 'swallow' air into my lungs. Using this trick I could probably survive for about ten to fifteen minutes, enough time to take the immediate panic out of the situation." If a respirator breaks down, or the power fails, Maggie must be ready to take immediate action. This means that she can never be too far from John's side. When they go out shopping and John stays in the van, she can never leave him alone for more than a few minutes; "If I'm in a queue too long, I have to leave my shopping and go out to John and check that he's allright." Maggie says that when they got married, people though she was sacrificing her life. "When I gained my freedom," John explains, "Maggie lost hers. I get all the sympathy and she gets all the work." Maggie doesn't see things that way; "Although our life seems abnormal, to us it's very normal. We're like two halves of an egg slotting together." Because he can only speak when his respirator allows him to exhale, John talks in short phrases punctuated by long pauses. To compensate he speaks very sharp concise sentences, to avoid being interrupted and misunderstood. "If you're paralysed and none of your muscles work," John was once asked, "what makes you're blood go round ?." But the heart has its own nerve centre which sends impulses independently of the brain and so will continue to beat automatically providing is getting an adequate supply of oxygenated blood. The muscles of breathing however, depend on striated voluntary muscles to work and have to be driven by a nerve centre which is situated in the brain stem. In 1994, John was awarded the M.B.E. in the Queens Birthday Honours list. "They said it was for service to disability, " he says, "I think perhaps I'd touched people's lives. I'd been around so long, they probably thought they ought to give the old sod something." Polio remains a major killing and disabling disease in Africa, India, China and south-east Asia, some of the most populated parts of the world. Although the virus is under control in the UK, John cautions complacency, "although polio isn't the devastating scourge it once was, the virus has not been eliminated so it remains vital to continue to take up the vaccination." To mark the 40th anniversary of the vaccine, the British Polio Fellowship designated 1996 as Polio Awareness Year. Polio dramatically changed John's life, but he puts his own disability in perspective, "Many people look at me and think poor old John," he says, "but it's not like that at all. People need people. There are many people in this world who aren't loved by anyone or anything. I'm very lucky" Of Maggie he says, " She's a very good woman, without doubt. She's given me the push when I've needed it. She gives me the power to survive." In December last year John and Maggie celebrated 25 years of marriage. In 1955 John wasn't expected to live more than 25 hours. Breathtaking.